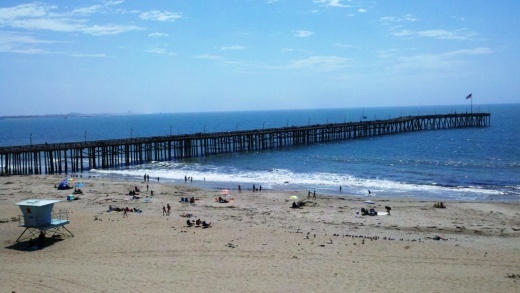 The Ventura Pier was originally constructed in 1872 and is a favorite spot for local fishermen. The Pier is 1,600 feet long and underwent a $2.2 million renovation in 2000 that added an 80 foot octagon shaped extension, benches and more. The Pier can be accessed off of East Harbor Boulevard, close to the Crowne Plaza hotel off of California Street. Beach House Fish restaurant is located on the pier. On the west side of the pier is a playground area with some unique play equipment. My kids always enjoy it here because of the great combination of the beach, pier, playground, quick access to bike rentals and food. The former Eric Ericsson's (now Beach House Fish) next to the playground on the pier.